Are you one of the 870,000+ Project Management Professionals (PMP)® who are thinking about your next career development move to stay fresh, keep current, reinvent yourself, or just refine your knowledge in a professional area of interest? I’d suggest that the best thing for a good number of PMPs to think about is the PMI Professional in Business Analysis, or PMI-PBA®. This certification from PMI has shown extraordinary growth since it was introduced in 2014. Year-over-year growth from 2017 – 2018 was a whopping 79% and growth in the first five months of 2018 has been over 25%, far outpacing the other PMI certifications. The PMI-PBA addresses the domain of business analysis within the context of projects and programs, which is the primary, if not only, context in which PMs do business analysis. Specifically, the exam pertains to tasks related to everything from building a business case to evaluating solutions once implemented. Below are three commonly heard reasons why PMPs discount the idea of pursuing their PMI-PBA, and three counterpoints to those reasons. Counterpoint: Yeah, you probably really do. Remember what your project management practice was like before you pursued your PMP? I’ll bet it wasn’t as rigorous or disciplined as it was after you got your PMP. The fact is, when you start refining your understanding of what BA work is all about, you are going to recognize activities that you have been doing all along. It’s hard to recognize the boundaries of the PM and BA activities when you haven’t spent time with materials to help with that understanding. And titles are often of little help discerning who is doing what. The bonus of spending time prepping for your PMI-PBA is that by learning good BA practices, you come out of PMI-PBA certification preparation with a certification, but also a more refined understanding of what those BA practices are and how to use them. Take a look at the PMI-PBA Examination Content Outline, and see if you don’t recognize things you do in your project work. The additional bonus is that you come out with a refined understanding of what PM practices are, as well. The delineation of PM and BA work comes into focus, creating a certainty about which role you are filling and when. This holistic view makes you more effective when filling both roles, and it makes you a better professional partner when working with a BA. Counterpoint: What you don’t have time for is sub-optimized professional development. You will need to earn 60 PDUs to keep that PMP current, and good news: PMI-PBA prep time will count toward PMP PDUs. It is actually a very economical approach to professional development. Plus, if you’ve endured the PMP, it may be inspiring to know that test takers who have both a PMP and PMI-PBA consistently report that the PMI-PBA is a less intensive exam in terms of difficulty. It’s still four hours and covers a lot of material, so I’m not suggesting it’s easy or that you don’t need to take it seriously. But the PMP experience prepares you very well for the PMI-PBA effort, and if you’ve been through the PMP and all that entails, the PMI-PBA is going to be an easier certification journey. Counterpoint: That is true and the PMI-PBA will help you do that. No need to explain the importance of Agile being a part of everyone’s professional development. But the PMI-PBA actually is a great way to broaden your perspective on how to apply your project-related skills in an Agile environment. These days, both BAs and PMs from more traditional backgrounds are having to translate their skills into an Agile environment. Most Agile environments specifically seek BA skills on the team in order to work with the team and product owner on backlog refinement and management. The PM skills are often a tougher sell. To be sure, both PM and BA skills are needed and have a place in Agile, and an understanding of where those disciplines intersect and diverge is enormously helpful when considering how to apply them in an Agile environment. Our titles are often obstacles to moving us forward or in the direction we want to go. Certification can help to paint a fuller picture of what we offer, and the process of getting certified forces us to develop command of the language and creates familiarity and confidence with tools so that we can best advocate for ourselves. If Agile is where you want to go, BA skills are going to help you get there. 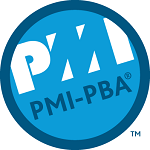 If you are a PMP, do yourself a favor and take a look at the PMI-PBA to improve your PM skills, gain a greater appreciation for the BA work you are likely already doing, and leverage your time spent to earn the PDUs you need to keep your PMP up-to-date. As I always say, the letters after your name are nice but they don’t make you better at what you do. That only comes with practice. And best practice starts with understanding the industry standards and good practice identified in the industry standard publications. Developing fluency with the standards gives you confident ownership of what you’re already doing, inspires you to expand your thinking and experiment with new tools, and it gives you perspective from which to tailor your practice to meet the needs of your unique stakeholders and business. I have yet to hear from someone who said pursuing a certification wasn’t time well spent. So, PMPs, what are you waiting for?